Ok, so there are a LOT of things that bloggers do in their day-to-day blogging life that make most “normal” people smirk. Or even laugh out loud. For starters, we’re usually super-glued to our smart-phones, ears acutely attuned to distinguish a Twitter alert from a Facebook notification. That’s a skill, right? Put us together in small or large groups and an outsider looking in would wonder how a conversation was actually taking place … because we’re all talking to each other while looking down at said phones. Bloggers are also extremely fond of taking photos. Of other people and things but also of themselves. This particular photo genre has been lovingly termed “The Selfie”. Taking of Selfies is, of course, not limited to bloggers. It was actually fashion designer Alex Perry, who three years ago, insisted that our photo together actually be a Selfie. He grabbed my camera and said, “this will be better”. He was right. It was. The angle (from above) is way more flattering. I’ve been utilising and implementing the Selfie ever since. And last week a Facebook reader asked me to write a post about how to take them … so here I am. Now, as someone who is creating visual content throughout the day – and often that content is based on items I might be wearing or how I’ve done my hair or makeup – the Selfie has become very much a part of my blogging life. Which amuses my teenage children no end. I use one of two devices: my iPhone or my Canon G12 camera. Yes, it’s easier to reverse the lense on your iPhone camera so that you can see yourself as you’re taking a photo BUT the quality of the photo’s resolution is not so good this way. Practise taking the photo without seeing what you’re taking. You’ll have to “guess” where the camera button is to take the shot but after a few attempts, you’ll get the hang of it. If doing an outfit shot and wanting to feature all the outfit, use an app like PicFrame to create a montage that includes a full length shot and two close ups of accessories or details. Melbourne blogger Carly Jacobs (aka Smaggle) knows how to work her iPhone camera for selfies and has written a handy dandy post about how to be awesome at Instagram. Whether it’s in a car or in front of her bathroom mirror, Sydney blogger Danimezza rocks an iPhone selfie. I’ve love that the viewer on my Canon G12 can be flipped and turned so that I can see the Selfie I’m taking. Unlike the iPhone, this doesn’t affect the quality of the photo. I used this a lot when getting photos of me with other bloggers at Blogopolis recently. You can still use a camera such as this if you’re looking to do a mirror Selfie too – I just take off all my strap and case attachments so it’s clutter free. Practice angles – both close up and how you stand for full-length mirror shots – so that you know exactly how to get your best look quickly and easily. Shoot in the best light possible. Have that early morning or late afternoon glow beaming towards your face. Or, shoot with your face facing towards a window. This applies equally for when using your phone too. Western Australia-based fashion and lifestyle blogger Karen Cheng does the camera selfie SO well. Her photos are clean and well lit. And she uses just a point and shoot. Blogger Karen Cheng has a signature selfie style on her blog that really works. Sydney blogger Sarah from A Beach Cottage works her DSLR like nobody’s business. Yes, mostly she photographs her amazing interiors and beach vistas but she’s also the queen of a mirror selfie, especially one that shows off her beach cottage. 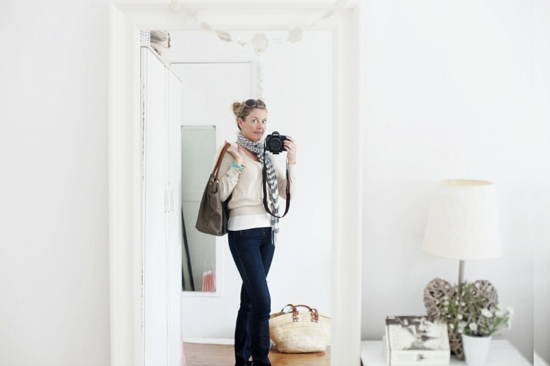 Sarah from a Beach Cottage works a DSLR selfie that also showcases her Beach Cottage interior. Love that. How about you? Are you a Selfie Master? What tips do you have for young Selfie players? Thanks so much to everyone who played along with my Saturday blogging linky last week. Sharing your blogging knowledge with other bloggers and potential bloggers really is how this blogging world best goes round. Remember if you want to join in, just add your link below. Please fill in the box where it says “name”: STYLING YOU: A blog post. That way your blog gets a plug and if you include the title of your post, you’ll attract readers interested in the topic. I totally take back what I said in my original comment about ‘mirror selfies’ being tacky! I’ve warmed to them now…just, whatever you do don’t put your flash on! I know you don’t Nikki, but there’s some that do and then you get the lens flare in the mirror or an overexposed pic! Good tip – and try to avoid using a flash at all with your photography. Shoot with good lighting from the start and the photo will always be better. Ahhhh great post! I take my selfies for my LBD project while standing in the street, running around a tripod – lots of smiles from neighbours and passing traffic.. Mortifying yes but the things we need to do to get the selfie right! Hahaha … and these kids they’re growing up to be way better photographers than us! and don’t get me started on the 3yo’s ability to navigate ipad, pod, phone, laptop etc. she changed my screensaver from a pic of both her and her brother to just herself. evil, but have to admire her style. Thanks for this fabulous post. Can you please give me and my ‘Plus Size’ friends some advice on how to take nice selfies without looking hideous and displaying 15 chins. I’m about to start my family lifestyle blog and plan to take a lot more selfies, but the idea scares me! Not having an iPhone, and not being a ‘cell phone kinda gal’, I use a small pocket camera and a tripod to take my selfie fashion shots. BUT, there are also extenders one can purchase that give you a longer arm so to speak when taking photos….. I think they are about $50. That’s the route I plan to go next so that I can put the tripod away. I like the idea of those extenders! 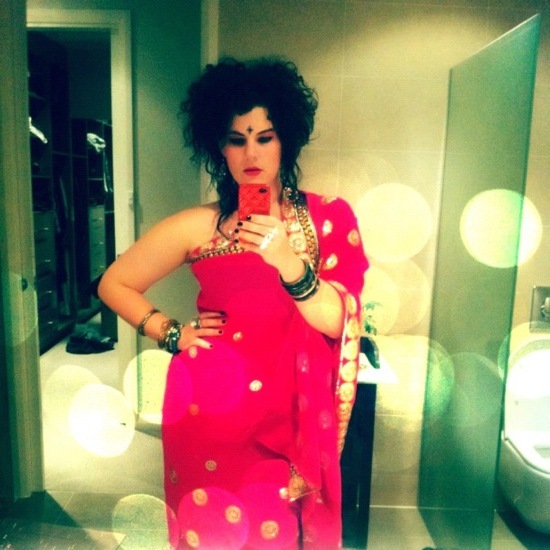 Oh dear, I am a selfie shocker…. so needed these tips. Have just snapped off a few and it’s reminded me that I really must find my lost lipstick!! Seana, sometimes if I’ve got a bright lippy to pop on it deflects from my otherwise unmade-up face. Good ploy! It must be done. We are geese together! The arm outstretched angle is the best selfie ever – see that photo next to my comment? Selfie! Ooooh – I am no good at the selfie… Not many of those around… In fact – there are not many photos of me around at all! No excuse now … get out there and do the Selfie! I have go go gadget arms which helps. Long limbs come in very handy. I love Saturdays and all the blog linking. Very timely blog post Nikki, but what if you have an Android smart phone? We have Instagram on Android now, but what other apps can you use to do the montage thing etc? And as Sarah (a beach cottage said) … nothing wrong with feet selfies! I would give anything for a (clean) full length mirror in a well lit spot! It may have to be a pre-requisite in my next house! Will be in mine too! I know Francesca! But really it’s just a matter of having a little fun with it! This is a great post Nikki ,I am not that good at taking a selfie ,but I will practice what you have told us and I’m sure I will be taking a “selfie ” like a pro.I must admit Sarah from abeachcottage does do Pictures well,they are always amazing quality and she gets the light right and your not too bad either all your “selfie’s ” are good quality too.Great topic! Sarah is an inspiration with her photography – love it! She’s pretty good herself too! Love this post, Nikki. I’m forever getting rolly eyes when my kids see me taking selfies. I still haven’t mastered it. But it’s fun practising! Same here Tina … practising is fun though! I do get mocked for my love of mirror selfies and my shoe selfies. Selfie takers unite, I say! Thanks for this one. I need to work on my selfies. I would go one step further and say make sure the toilet can’t even be seen. My pet loathe about bathroom selfies. Was first thing I noticed about top pic. Couldn’t even look at the person, had to scroll away from it! It’s actually referenced in the photo on Instagram. It says ‘Hi toilet! I see you!’. HA ha! Mine has the toilet seat up IN THIS POST! Ah Smaggle… being innapropriate since 1983. If only we could walk around like that! I love shoe selfies … they are perfect for days like last week when I still looked grey even with makeup on!! Love your point about growing your confidence through selfies. Your Gorgeous Sarah,and that’s a great tip to improve our confidence by taking” selfies”,especially over 40!! I use my phones photo editing software with selfies, it successfully chops off my arm 🙂 and more often then not, doesn’t end up looking like a selfie. I’ve been using my camera’s photo editing software more too – quite easy and makes such a difference! For Instagram to “fit in” a full length selfie, take a full shot and use it as part of a 3 image montage using picstitch – or I use picframe. It will run the length of the square image and then you can have two feature/accessory images on the right hand side. Does that make sense? Haha. Dani certainly has the Selfie nailed. She was giving tips at the Blogopolis after party, too bad we’d all had a couple of beverages and it was so dark we needed the flash…. Errr, cringe! For me anyway, she always manages to come out looking fab. Can I just say that I adore the fact this post exists! HA. I know. Right? 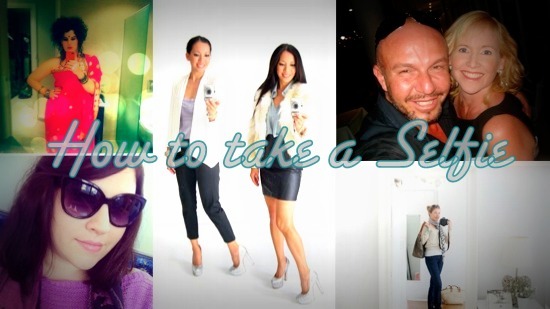 Cannot believe I’ve written a post titled “how to take a Selfie”. Great comments from everyone else too – with more pointers! I am a shocker at the selfie, so I rarely do it! I have once taken about 30 photos trying to get the right angle and light! I just want that double chin to go magically away- so I have known for a long time that a shot from above does the trick, and to make the girls seem bigger in necklace/scarf shots( another of my battles-if only that double chin would travel south and belly north!) above -with arms close to achieve cleavage! or from underneath- to achieve bumpage, not straight on is the way to go! I mastered it so I could avoid chin “issues” … I get much ribbing from my children about it! Another tip for chin *issues* (despite how small I am, my chin is weak) is hold your tongue to the roof of your mouth. I would say yes…I am quite good at taking a ‘selfie’. Sorry if I offend anyone with my next comment, but I think photos of yourself where you see your camera/phone in the mirror are tacky. When I take a selfie in front of the mirror, I look at myself in the camera’s live view screen before taking the photo to see if it looks OK, then I will take it looking down the lens. No offence, Cotton Candy Diva … I actually don’t mind them – adds a little something … but each to their own. And yes, I do the outfit selfie with a timer and tripod but that would be more for my blog images, not my social media images. You’re right, it is up to personal preference. I think why I don’t like mirror selfies is because most people look at their camera, so it kind of looks weird. again each to their own though. Great post! I’d also like s full length mirror in my house with good lighting! 1. The + volume button on the side of the phone also takes a pic – much easier to find than the one on the screen. 2. If you just want your face/hair/shoulders turn your phone around so the camera is pointing at you, not the mirror. You can see the screen in the mirror, and no phone in your shot! Oh, Tasmin … thanks for the +volume button tip. Doh! Never knew that. your second tip – that’s what I do. I can line myself up with what I see in the mirror. Haha. And here I was thinking I was the only person using the mirror to preview the better camera Selfie. 😉 Nice addition to the post!! I have taken a couple of selfies on my trip abroad as I wanted to capture me in a tourist destination. I have become better at it – but these tips will help. Danimezza takes gorgeous selfies. I hope you don’t mind in the link up this week I’ve posted to my speech- which is so much about the way blogging has helped me. 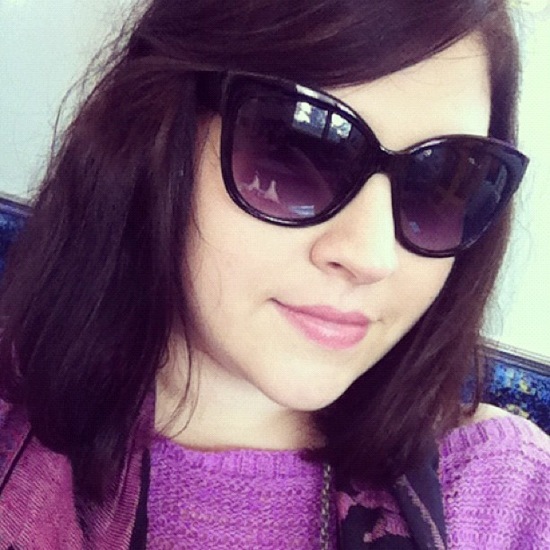 Ps – I got a High Distinction for my Masters thesis about blogging – woo hoo! Absolutely, Carly … in the olden days we would have had to ask a stranger to take a photo of us!